I have run Linux for several years now. It is a great operating system--yeah, I know it's really a kernel. I can always brag to my Windows and Mac friends of the ease of pulling down development libraries, packages, and files within seconds without having to scour the web. I am a gamer, however, and have always wanted to play games without any hassle; to own a game and have everything just work. WINE has come a long way and has run World of Warcraft for me just fine, but with many other games I'm forced to tweak settings, use sub-par graphics, or worst-case scenario boot into Windows. To solve my woe, I decided to get a console. Hence, the PS3 sitting on my cabinet. I'm also looking forward to buying used games at discount, which is pretty much unavailable for PC gamers. Having not owned a console since the Sega Genesis--I had Resident Evil 4 and a Gamecube for a few months--I've fallen a little behind on the console world. The PS3 video snapped into my monitor via HDMI and I plugged the component audio cables into an old surround sound receiver. On starting the system, I passed through a brief configuration menu. One screen asked, "Do you want video and audio to go through HDMI?". Well, technically no, I just want HDMI for the video. So I answered no and my screen went black. I restarted the PS3 and answered yes to get video and setup audio afterwards, but I thought it was a funny question to ask if you're going to make a user's screen go black. The PS3 menu is pretty sleek. It's a long horizontal bar of menus, where each focused menu will display vertical submenus of options. It works well and although I got used to it quickly, I don't see it as replacing a typical vertical menu. Both the PS3 and XBox 360 have had many consumer complaints in reference to the resolution many games and videos run at. For example, a game might render at 720p and be stretched to 1080 on the actual display. Although this is noticeable, all the games and videos that do it still look decent. I had a chance to play a few demos and realized the incredible difference in graphical quality between video games. The aliasing in Mirror's Edge, for example, is horrible. The game looks well enough and has cool-colored art direction, but I can't help wonder if they couldn't at least do some post-process anti-aliasing. I've heard Microsoft actually has a stricter policy on anti-aliasing, but I can't reference that. I have been having fun with features and like having such quick access to all the different playable demos. It has been a lot of fun to download these demos and see if they're worthy of my wish list. I enjoyed Half-Life 2 and always wanted to see how the first and second episodes turned out. The graphics are starting to show their age and the textures appear a bit blander than I'm used to compared to my PC. I'm still surprised how bad the loading times are in this game. Dying can take what feels like a minute to reload a level even if I died a few feet from the last load. What is the system paging in and out? Portal is a refreshing change. It satisfies that little first-person-shooter-puzzle-genre craving I never knew I had. Although I haven't gotten into Team Fortress 2 to its full degree, I have seen it in action and have been very impressed with the graphics this game puts out. Some people were disappointed that Valve didn't attempt a realistic rendering system like everyone else in the industry. Their loss, I guess, because the game looks great. They have a great presentation, Illustrative Rendering in Team Fortress 2, that really showcases the art direction to make such a great looking game. Here's the high-quality video. If you like art direction or new shader designs, I highly recommend reading their slides and technical article. I played parts of the full version at a friend's house and downloaded the demo on my home machine. This is one the best looking games I have ever seen. The animations are smooth, the palettes are nicely colored, and everything is supremely sharp. The draw distances are incredible. Insomniac does Playstation exclusives and has always done a great job pushing a system. It also handles really well and is just fun to whack things with a wrench. I have included a couple screenshots stolen from Insomniac's site. The game looks even better in motion. This game got polar reviews with reviewers conflicted between its poor gameplay and great art direction. 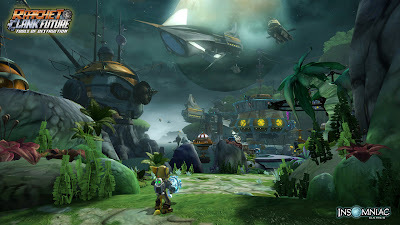 The game features about three art styles sometimes jumping between 2D and 3D cutscenes and looks great. It's a unique genre, but the first "boss battle" had me constantly fighting with the camera just to keep the enemy on my screen. I stopped after completing that section fearing the rest of the game would include the same tedious and frustrating camera coordination. Playstation Home got terrible reviews days before I received my PS3. I wasn't excited to enter this online world, so I was ambivalent to these postings. I was a little curious though, and gave it a quick pass through. I can add to other statements that there is no reason why anyone should use Playstation Home. After a boring session of creating a customizable character, I ran around the courtyard waiting for other characters' skins to load on my machine while an empty shell of a person modeled their movements. Moving into new buildings required additional downloads. While I realize this happens only once, it is still annoying for the first visit to this online world. Entering the theater, I sat down in an available chair and waited for the video to play. Many people were standing up in front of the screen talking to each other, while others sitting in the audience with me were calling those in front to stop being duchebags and sit down. I realized then that Playstation Home is the 3D visualization of all the people on the internet I try to avoid put in the same room as me. There is nothing redeeming about it and although it's in beta, I can see no reason for anyone to use it. I believe a product should enter beta to work out bugs and get customers excited, but I believe most people like me will get a glance at it be extremely reluctant to return. Home might one day be a really excellent product, but it's going to take some extreme makeovers to make it such. I have heard complaints about this game lacking game and being more of a tech demo. I must say that this game is amazing. I have always enjoyed platformers, and this game is a great platformer by itself. 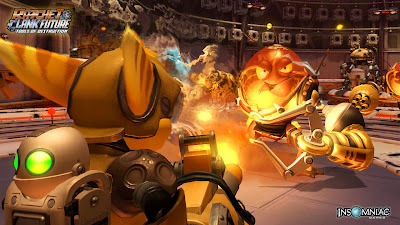 It features a zany story, where players can pass through levels in coop (either offline or online) with up to three others. Most levels can be completed alone, but it's funner to play with a friend(s). The graphics looks sharp and feature crisp textures, HDR effects like bloom, and decent camera work. Every once and a while the camera will zoom too far in or out, but it's tolerable most of the time. Smoke and fire effects aren't perfect, but they're pleasant to watch. The gameplay implements a simple jump and grab mechanic so the controls are easy to master. Like most platformers, the characters are required to do a lot of jumping, but this game includes a simple grab mechanic where the player can grab certain objects if they have a "grab-able" material like sponge instead of stone. This is used for hanging, swinging, pulling boxes and levers, etc. There's also a depth or layer component where players can move closer or farther from the camera. This is usually done automatically such that a player jumping from a depth of say 3 will naturally move forward to land on a platform of depth 2. The mechanic isn't perfect and sometimes causes problems (like totally unfair deaths) but is forgivable since it generally works well. The gameplay is somewhat forgiving. There are frequent save points littered throughout the game that allow players to restart there after dying--this only works a few times before the save point runs out of lives and the players must restart the level. Also, objects that can kill the player by squishing or burning him/her usually give the player the benefit of the doubt by squeezing him/her through the crack or lightly singeing the player. The real innovation of Little Big Planet is the excellent use of physics in the game. Each object has its own material with corresponding properties like friction coefficient, mass, texture, etc. It is fun to see your avatar catapulted over a wall or balancing on a teeter-totter-style platform. The best thing about LBP is the level design. The game has been in production for quite some and the developers have mastered the engine creating many beautiful and crazy levels. I have seen almost every non-combative platforming mechanic put into these levels as well as new components that add new challegnes using physics, requiring teamwork with cooperative players, and just some new creative puzzles. Some levels require two, three, or even four players to pass certain puzzles. These are usually optional off-the-route treks to obtain additional collectibles. It's hard to find good cooperative games these days so it's gratifying to see one that has really done such a great job nailing so many features. I haven't any gotten to the level editor, but it's on the to-do list. I can't imagine a video-game playing PS3 owner not purchasing this game unless they adamantly hate platformers. My first few days using a console have been very satisfying. That feeling of running a game I own and not having to fight the system to get it to play is most pleasant and I urge other Linux users to consider having a separate machine like the PS3 to handle most of the their gaming needs. It's also a great Bluray player. After being on the job hunt a certain amount of time and seeing my carefully chosen list of possible employers start to dwindle, I started sending on tens of unsolicited resumes hoping someone would bite. One such company was Dreamworks Animation. After putting together an impressive resume and cover that fit me as their ideal candidate, I sent it off. Seconds later, I received an automated response "The following addresses had permanent fatal errors". That sounded really bad. Not only were the errors fatal, but they were permanent and would remain so for the rest of time. I sent off another e-mail to the webmaster asking if my application was in fact received. That responded with another automated response claiming the mail server itself was down. I took it as a sign that working at this company was not meant to be. I received a phone call a few days later. The conversation was typical for a first call--verified my information, my interests, what job they were trying to fill. Even though I applied for a programming position, they wanted to interview me for technical director. Since it was an interview, I accepted. The Dreamworks interview process was actually quite simple for me. They scheduled a video conference and sent me down to a local FedEx Kinkos. In a large conference room filled only by myself and a TV/camera stand, I sat at the end of the table while I was grilled by Dreamworks employees. The employees interviewed me in pairs or teams. The first team was "Team Oddball" as they called it, which asked trivia-like questions. Unlike my interviews at Intel, they actually remembered the answers to the trivia questions, which made the quiz a much more pleasant experience. One question, for example, was "If you have a three-gallon and a five-gallon bucket with unlimited water, how do you measure out four gallons?". The other questions ranged in difficulty. Most of them were pretty fun and allowed me to think and explain how I would do it. The next pair asked more technical questions related to graphics, but it was a pretty simple interview. Subjects ranged from 2D intersections to level-of-detail. Every person that interviewed me was a technical director, which I really appreciated. I used the Q & A time to ask them about a typical day, what they liked, challenges, etc. I was supposed to have an interview with the director of technical directors, Mark McGuire, who oversees all TDs on all movies, but he wasn't available that day. To make up for it, he called me the next day. He mostly wanted to make sure, as everyone had, that I had a very clear idea of what this position entailed. I always found that a difficult question to answer as I don't think I can ever understand a position unless it's a common profession or I spend a day doing it. A few days later I received an actual offer from the company. The hiring manager explained compensation, the benefits like provided breakfast and lunch, etc. He worked hard to sell me on it. Even though I asked for more time to complete the hiring process with some other companies I was interviewing with at the time, I ended up accepting the offer. I start on the 5th of January. Although I didn't want to live in California, I'm excited to start at what appears to be a fun and dynamic company. By the way, if you haven't seen Kung Fu Panda, the humor alone sells it. The art direction is just more bang for your buck.